The word Albedo (From the Latin albēdo, "whiteness") pays tribute to an activity that for over 30 years has taken place here and which is represented by its industrial archeology - a lovely 1930s kiln, one of the few still in existence. The farmhouse was founded in 1993 when Anna and Angelo, helped by their son Giulio, enchanted by the alchemy of the place, decided to move to the countryside, after years of city life, re-establishing a close contact with nature and embarking upon their spellbinding adventure. 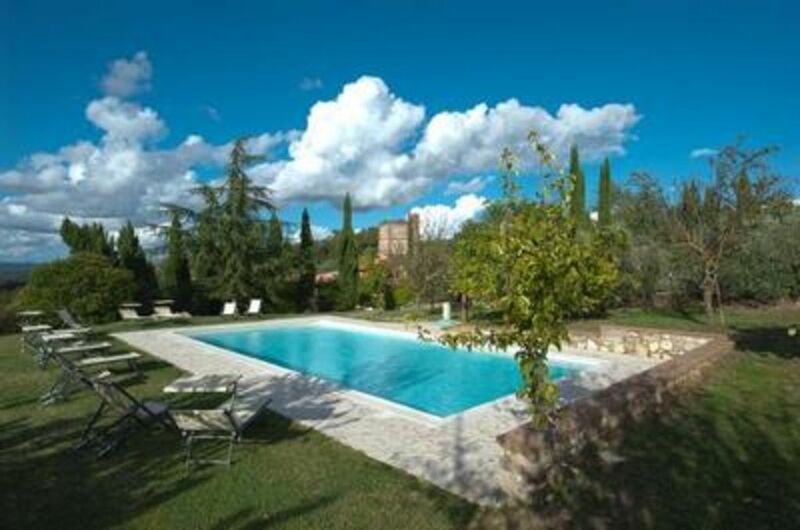 When, in 2010, they had to move to Perugia, Giulio, as he did not want to sell the farmhouse where he grew up, decided together with his friend Francesco to rent it as a villa with garden and private pool (6mx12m deep from 1,10m to 1,40 m). The villa is composed of 5 bedrooms with double beds (2 of which in the attic) , one single bedroom, 4 bathrooms (3 with showers and one with tub), kitchen with dish-washer, sitting room with fireplace, 2 living rooms with coking areas, washing machine, television, wifi internet. Outside 2 pergolas with table and chairs and barbecue. - Heating: according to consumption (Mandatory). - Final cleaning: once per object Costs amounting to 100 EUR (Mandatory). - Fuel for chimney/fireplace: per object and day according to consumption (Mandatory). - Pet: per object and week Costs amounting to 25 EUR (optional). - Visitor's tax: per person and day Costs amounting to 1 EUR (Mandatory). Welcome to the world’s most photographed panorama! There is indeed no piece of this landscape left that has not already become a snapshot. A wide sea of clay spreads out over the countryside Southeast of Siena: one evocative, soft hill follows the other, the few forests leave space to the endless stretches of wheat fields and grassland, able to change their colours with the succession of the seasons. The Crete Senesi are indeed a quite different world. Someone has defined them as “moonscape”, but only because he hasn’t seen them in spring, when the explosion of nature makes the fields become green waves, caressed by the wind, or in autumn, when the farmers’ ploughs bring the clay back to the surface, with its beautiful violet shimmer. The Crete are, without doubt, a land of agriculture. In the first place a land of wheat and land of the shepherds. Not by chance it’s famous for its sheep’s milk cheese, unique like the unmistakable flavour of the wild herbs that give their aroma to the sheep’s milk. Land of olive groves that produce the fine “Terre di Siena” oil with guarantee of origin (Dop). And right here in the area of the Crete one of the rarest and finest white truffles of Italy can be found. In this clayey region with its endless horizons we do not find a lot of stone. Almost everything is made of bricks and therefore made of clay: the beautiful farmhouses that stay isolated on the top of a hill, lined by high cypress trees; the magnificent monuments that mark the territory like cardinal points, from the Abbey of Monte Oliveto (spiritual headquarter of the Crete Senesi, with a marvellous cloister with 16th century frescoes by Sodoma and Signorelli) to the fortified medieval storehouse for wheat Grancia di Cuna, from the castle of San Giovanni d’Asso to the city walls of Buonconvento. Only around Rapolano, land of the hot springs and the travertine, stone is a protagonist. Stone and bricks meet harmoniously in Asciano, chief city of this territory centuries ago, where we can admire side by side the Sienese city walls of the 14th century, the Romanesque architecture of the Basilica of Sant’Agata and the artistic treasures of Palazzo Corboli, a glorious medieval city palace that today houses a rich museum. Pet (Per property and week, to be brought by the traveller 25 EUR).